Pi Chapter has in its membership numerous deserving Brothers who have gone above and beyond the call of duty. 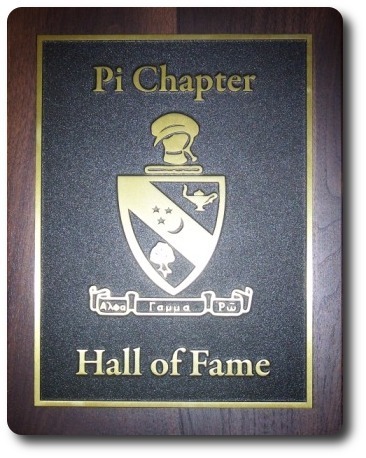 As such, Pi Chapter has formed a Hall of Fame to induct these members in an effort to highlight the significant accomplishments of these men to Pi Chapter and to serve as examples for all to follow. Nomination will be solicited beginning at the Homecoming Alumni meeting and will conclude on the first day of February. A selection committee will be comprised of one Board of Directors member, two alumni, and one undergraduate. This committee will be appointed by the Alumni President. The induction will take place during the Homecoming celebration annually.The class may consist of up to 2 members, only one of which may be deceased. A plaque to hang in the Chapter house will record the names of the individuals inducted with their year of induction. If they are of another Chapter, their Chapter will be engraved with their name. Each inductee will receive a plaque signifying their induction into the Hall of Fame. The original 19 members of the Pi Chapter Honor Roll served as the first induction class. The Pi Chapter Honor Roll recognizes those Brothers who have made a significant contribution to Pi Chapter and to Alpha Gamma Rho. Any contribution above and beyond normal activities will be considered, but one thing must always remain the same, the contribution must always be made with the ideals of Alpha Gamma Rho at the heart of their endeavors with special emphasis to Pi Chapter. Brother that has contributed something special to Alpha Gamma Rho. A Brother from Pi Chapter or another Chapter. Contribution made by Brothers of Pi Chapter can be made at the national level or to Pi Chapter. A contribution made by a non-Pi Chapter Brother must be made directly to Pi Chapter. Brother must have graduated a minimum of 10 years before induction.